Project Narwhal. – Dirty wet dog , boats and sailing. I have been doing what i usually do with boat projects ie sitting up late at night and thinking about the project. 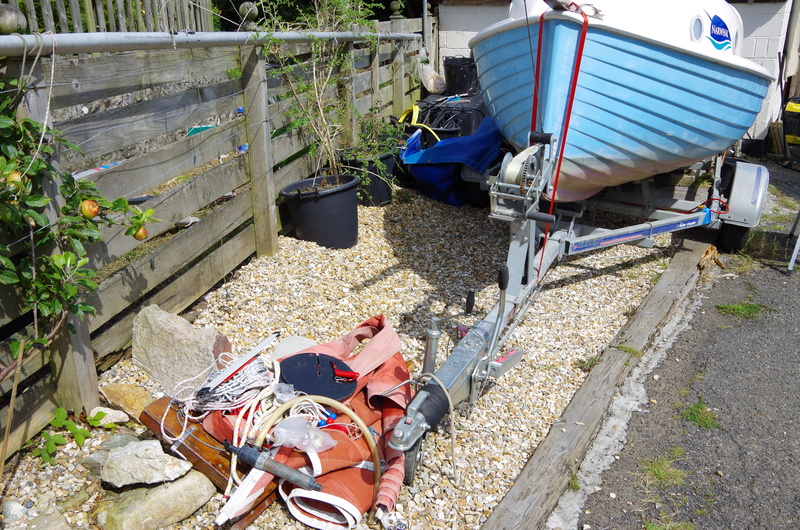 This post won’t be much about what i think about the boat so far because apart from sorting the gear out, getting the spars off and having a crawl around in the cuddy i haven’t actually done anything yet. What i am going to start with is everyone else’s thoughts about aspects of the boat….for example when i was taking the spars off i thought “hello someone’s put this tabernacle on the wrong way round” and that reminded me of when i first got the liberty and discovered that the previous owner had fitted the rudder blade the wrong way round…..the steering was ‘odd’ to say the least. So : Father Ted has been sending me more and more information so lets start there. … and handrails atop the cuddy. available in teak from Force 4 with either one, two, three or four loops. Usual is four loop version either side of roof. Makes traversing the narrow side deck a lot safer. I really rated Ian’s choice of name as so appropriate, with sticky out bit up front on both boat and beastie. Good luck. 3. Oh dear, this is like scratching an itch. The shape of the cuddy does rather liken her to an ugly ducking, but it is a very practical size, and one gets to appreciate it in a blow with spray all about. The cuddy shape is reinforced with iron hoops glassed in, but they do not rigidly support a rig that is in real tension. The solution is a king post under the mast position, as DD16 has been fitted with by Ian. Plastic drain pipe works well in compression, but of course one can use wood or stainless material for the king post if that turns you on. The centreplate is a low grade iron casting. It is not completely flat and does have a shape. One can fettle the leading and trailing edges but beware of making these too fine as the metal is brittle. The flat aluminium rudder blade is prone to stalling, therefore a change to a wood aerofoil blade would make a great difference to the handling. Re changes to the rig. One could change to gunter, as the DD is outside the Class Rules that apply to the DY. However, the Bermudan rig works fine, and hoisting and lowering the main mast is a matter of practice, and with the tabernacle the right way round not so difficult. As the use of theboat is for pottering and maybe a little cruising, I would suggest keeping the Holt Reefing Luff spar as one can shorten sail, jib or Genoa, progressively. At present DD16 has the Genoa option. The mizzen sail while small is a useful feature, and of course is indicative of her origins. If kept on a mooring a fitted cockpit cover is essential, not just to keep the rain out , but also birds crapping over the inside. Again, like the sails, Exe Sails have made covers for the DD. Itch has gone away for the moment so better get on with some Sunday tasks. Good luck. Alan commented on the mast support arches. Trailer looks good the brake system is cable operated drums so must NOT see the water wheels only painted so same thing (I did a rebuild on one here to s/s discs the existing went in the scrap bin wheels the lot as the salt had done its work) The style of winch on the trailer is ok but can be a bit light if the boat is heavy to haul on. Boat looks ok can you fit on the sole to sleep ? sails probably not to expensive as they are fairly small, mast base Can you shorten the mast to remove the damage and take up the lost distance in the rigging which if original should probably be changed to spectra, PBO or similar anyway. Repaint is mainly prep as you know even if you get someone professional to spray it bast’d job with all those lands on the planking to do. Has the framing under the cabin cracked under compression ? time for some carbon capping or a nice polished s/s post or anodized alloy, you could even use some of that wood stuff that used to be used for boats, likewise under the aft deck. Having a ballasted board is going to make it a more stable boat and in our advancing years that a good thing. Pete Cash has commented on the cuddy and re-rig a couple of times. Trailer is a big plus. I would get it, as the rest is straight forward. Maybe in long term fair the foils, again big job of removal and plating already done for you. Would rerig as tall gunter to make spar handling easier. Finally, coil type tree wrap on the sprit, painted ivory. Ok i think that’s everyones comments so far. I am not planning to keep the boat in class so the project is more about building a small camping cruiser out of the boat without making any major changes to the hull and cuddy. I am almost certainly going to mess about with the rig once i have sailed her a couple of times and my main thinking at present is which way to go with that. Interestingly i did note that the tabernacle has been put on back to front and i might fix that today and first : then i get the rigs up. I do have a nice aerofoil shape wooden rudder blade kicking around here as well so i should be able to build a new rudder out of that. Rig options : is what i am thinking about. I’m not a great fan of the bermudan for a small boat like this mainly in that the mast has to be pretty tall and it needs the boom to work properly…ducking under that will be an issue for me with my immobile back. I don’t particularly like gunter either for similar reasons. Long term i fancy a Lug rig but that doesn’t seem a good option for this hull/cuddy. What i am leaning towards is the Wharram-esque short ‘Dutch’ gaff with a soft wingsail like the ones Hanneke Boon designed for the JW ‘Tiki’ range of small cats. I had one of those and that boat went like smelly stuff off a shovel in a breeze !. That can be rigged without a boom which loses some downwind efficiency but does mean that there isn’t a low head-clunking boom. I actually like the short Dutch gaff appearance especially a curved one. Lets see if i can steal a picture off the internet without JW noticing : this is the basic idea with the soft foot and short gaff and the luff having a pocket ‘wrap’ around the mast. I had one of these and liked it. The mast is a simple tube : people build either simple straight (hollow) ones in tree-wood , some use alloy poles. I should be able to find a 3 inch dia ally pole that would do the trick….possibly even carbon if the tubes are still made. Only problem with the sail is that the sheeting angle makes the deck attachment a long way aft. Ted has been commenting more on my modification ramblings. 1. Hi Steve, Father Ted again. I guess that we probably all have spent time doodling alterations to boats that we have or intend having. and interesting times spent with such an activity. I am as guilty as the others and also have spent some time over the years seeing what may be improved with the Devon Dayboat, with cuddy shape viz accommodation and aesthetics, and/or improvements to the rig. So will be interesting to see what you come up with after your deliberations. May I be presumptuous in suggesting that it might be an idea to sail her before actually making any alterations. I guess that you may be aware that besides the 170/180 lb iron centreplate, there is 144 lbs of ballast in the form of two ingots of lead glassed in either side of the centreplate case. The position of the centreplate is located quite forward, as is also the main mast position, so combined with checking any effect on the centre of effort, is the need to take into account the position of the well rounded rocker, see quarter front photo of DD16, and length of bowsprit, and also the balancing effect of the mizzen “tailplane”. Main mast height, and main sail and foresail areas, are the same as the Devon Yawl presumably for simplicity and compatibility between the two versions. 2 .I await with some trepidation your thoughts on what you may actually do with the rig to this Dayboat. I guess that of many queries and comments that may/will arise pending what is to be revealed, is the one that are you intending to keep her yawl rigged. Btw while she may by some specs be technically a ketch not a yawl, sail size ration main to mizzen can also be a defining factor. For yawl see jolle. 1.think you are on the right track, just like wood spars ’cause they add to the classic look. had a early Freedom 33 ketch with the wishbone wrap around sails (giant pocket?) made by Storer Canada. Richard loved playing with Hoyt’s ideas and adding a mizzen staysail really helped offwind. long term chafe was an unkown at the time on these style sails, but we had no issues on an offshore run down to Mexico from CA, California that is. carbon spars were 12″+/- on the base and still had a good airfoil shape, not bad for 1980 tech. herersy, but l like the Dutch rig, even own a little Jachtwerf Zuiderzee Volendam double ender. ink you are on the right track, just like wood spars ’cause they add to the classic look. Next This has never happened before ! Enjoy the ability to wander out to the boat with tea in hand from your back / front door. Oh and not having to remember everything you might need for a job. Guess where my boat toolkit is ?